CONDITIONS OF SALE: None. Note that abstract paintings are allowed in mosques and synagogues, so can be offered for temporary exhibitions in these religious institutions. STORY: Biological male and female symbols were used to make the first abstract crucifix. However that is just the beginning of the story. The identity of the male on the cross is revealed both buy a yellow halo around his "head" and by the geometric shapes on top of the cross. Latter include yellow circles, triangles and a rectangle, arranged to resemble a crown, and a blue 6-point star (insinuating the Star of David). 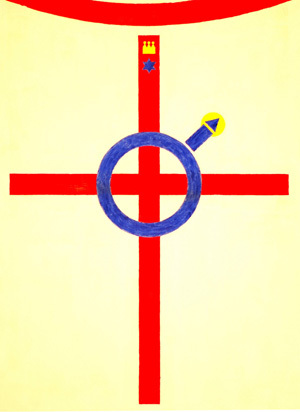 Top of the canvas reveals that the cross is just a pendant on a large red circle, which if completed, would give a standard biological symbol for female. This reveals who is responsible for the untimely death of this gentle human being. In his youth he invented a whole elaborate scenario of his godly conception, but as a young adult he ultimately could not live with the sins his mother committed. As Nietzsche somewhere commented, it is a pity he died so young – he would have learnt to love the Earth. Preferred buyer for this rather sad painting is the Church of England, both because of the resemblance to its badge and because of the famous affair with the removal and brief re-appearance of crucifixes in the early 1620s in the Royal Chapels of Elizabeth I. The price reflects a little known fact that the Church of England is a large financial institution, managing an investment portfolio worth more than £8 billion.